The revolutionary Aqua Matic is engineered to be easier to use and more reliable than conventional watermakers. 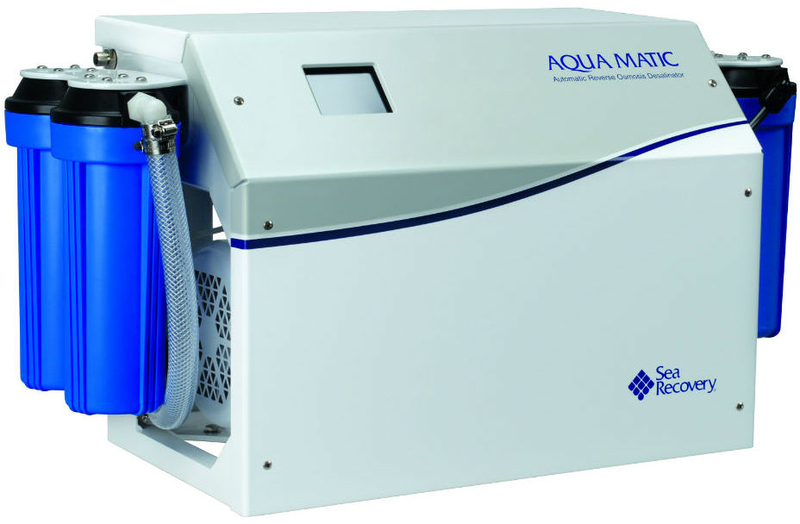 The Aqua Matic is able to regulate and monitor functions without the need of an operator. With one touch, the system will start and finish water production automatically, allowing you more time to relax and enjoy your cruise. Most technologically advanced watermaker available on the market! Outfitting your Sea Recovery System with some of the options and accessories below will extend life to your watermaker and lower your maintenance costs. Extends the life of the membranes by rinsing them with fresh water by merely a touch of a button. The Fresh Water Flush automatically removes all salt water from internal parts of the system and flushes the membranes with clean fresh water every 7 days. This prevents salt water corrosion of the internal parts and reduces biological fouling of the RO membrane. The Oil/Water Separator Canister protects the reverse osmosis membranes from oily or polluted water sources. The Commercial size Pre-Filter Canister replaces the Standard Pre-Filters, providing longer intervals between necessary filter cleaning and replacement. The user-friendly remote touch screen displays pictorial images of all operating conditions which can be viewed from any location on the boat. The Plankton Filter Assembly traps suspended solids larger than 100 micron, thus providing additional protection for your Seafari system's pre-filters, which ultimately prolongs the pre-filter element life. Charcoal Filter Assembly removes chlorine, taste, odours, and chemical impurities from the product water. This process of purification works without chemicals and leaves no residual in the water supply. The pH Neutralising Filter provides pH neutralisation of the reverse osmosis system product water. It comes in various filter sizes to fit your needs. The Ultraviolet Steriliser is the final process where 99.8% of all micro-organisms, such as reproducing bacteria and viruses, are sterilised. Ultraviolet replacement U.V. lamps are also available. Please specify voltage. The new SRC Soft Motor Start (SMS) reduces start-up amps by 45%. This allows operation from smaller generators if required. The Multi-media traps suspended solids larger than 30 microns to provide additional protection for the system's pre-filters, which can greatly extend pre-filter element life. Interested in this Water Maker? Please leave your details and a member of the team will contact you shortly regarding this product.